Ship Weight : 36.36 lbs. 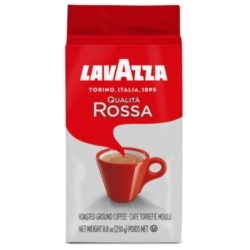 Qualit� Rossa is a blend of Brazilian and African coffees defined by a chocolaty flavor, a full body, intense aromas and a persistent finish. Its well-rounded and rich flavor makes this blend ideal for an energy boost to start off your day. Velvety mouth feel. Perfect for the moka pot. Intensity: 5. One case = twenty 8.8oz bricks. $0.65 / oz. $0.63 / oz. $0.60 / oz. $0.58 / oz.